For over a decade, we have assessed that the Benjamin Maddox called “junior” in Abbeville County and Laurens County, South Carolina, in 1800-1810, is identifiable with our known 3rd-great grandfather, Benjamin Maddox (1776-1855), who died in Crawford County, Illinois. We have based this assessment on our 3rd-great grandfather’s claim of South Carolina origins in the 1850 census, the presence of a child of our 2nd-great grandfather Joseph’s age in the 1810 census living with Benjamin Mattocks in Laurens County, SC, and the persistence of peripheral family names in census and land records in South Carolina, Kentucky and Illinois (especially the Gaines, Long and Ford families). But perhaps five – and maybe more – Benjamin Maddoxes appear in Abbeville County and Laurens County, South Carolina, in the years 1790-1811, and distinguishing them has been difficult due to a lack of corroborative records. Most of the records for the area were destroyed in fires in the 19th century. A closer look at existing records raises a number of questions about the identities of the known Benjamin Maddoxes appearing in records in Abbeville County and Laurens County in the years 1790-1811. The following evaluation, including peripheral names in census and land records, offers a clearer differentiation of the Benjamins. See this document for color-coded names. This Benjamin Maddox (ca. 1735-after 1810) is likely identifiable with the Benjamin Maddox “senior” of Charles County, Maryland, that we have called Benjamin Maddox (II). After moving from Charles County, MD, to Abbeville, SC, this Benjamin Maddox appears to have remained in Abbeville (and did not live in Laurens County, SC). 1790: The federal census of Abbeville County, SC, p. 468, lists Benjamin Maddox with 2 adult males, 7 males, and 3 females. He was living near Ignatius Posey, Walter Maddox, Thomas Donaldson, William Stone and John Night. 1800: The federal census of Abbeville County, SC, p. 19, lists Benjamin Maddox and a woman aged 26-45 years of age, with 1 male less than 10 years old and 1 female less than 10 years old. As in 1790, he was living near William Stone and John Night, as well as James Gaines and John Grey. 1810: The federal census of Abbeville County, SC, lists Benjamin Matox “senior” greater than 45 years old, with a woman older than 45 years, 1 male 26-45 years old, and 1 female less than 10 years old. He was living next to Elizabeth Matox and Janet Maddox, as well as Joseph Rutlege, Thomas Norwood, Benjamin Posey, Susannah Gaines, Richard Stone, William Ware, Henry Gains, and Peter Youngblood. Why was Benjamin #1 called “senior” in Charles County, Maryland, in Humphrey Posey’s 1784 will? All proposed sons of Benjamin #1 would have been in their teens at the time. Was there another Benjamin Maddox in Charles County – perhaps a brother or cousin? Would this open another ancestral avenue for us? The below Benjamin Maddox is traditionally considered the son of the above Benjamin Maddox. The below Benjamin Maddox shows up for the first time in 1800 living near Benjamin Maddox #1 in Abbeville, SC, but he moves to Laurens County, SC, in 1808 and remains in Laurens County thereafter. For decades we have identified him as Benjamin Maddox (III), our 3rd-great grandfather who died in Crawford County, Illinois, in 1855; however, the final record describing him as “dec’d” (deceased) in 1811 requires us to question our assessment. Other researchers have identified this Benjamin Maddox with a Benjamin Maddox who was born in Maryland in 1770 and died in Atlanta in 1864, but this assessment also requires a new look, given the 1811 record of his death in SC. 1785: The Turkey Creek Baptist Church was established and the original meeting house was erected on Richard “Dicky” Maddox’s land. Among the members were Martha Ware, Nicholas Ware, Caty Gaines, Henry Gaines, Molly Gaines, Susannah Gaines, Barbara Long, Elizabeth Long, Nicholas Long, Michael Magee, Benjamin Neighbours, and Rev. Joseph Redding (Source: South Carolina Baptists, 1670-1805, Leah Townsend, University of South Carolina, 1926, pp.182-192). 1800: The federal census of Abbeville County, SC, p. 22, lists Benjamin Maddox “junior,” including 1 male 45 years or older, 1 male 26-45 years old, 1 male 16-26 years old, 1 male 10-16 years old, 1 female 45 years or older, 1 female 26-45 years old, 1 female 10-16 years old, and 1 slave. He was living near John Reid Long, William Calhoun, John Calhoun and the Samples. 1805: Thomas Maddox died in Abbeville County, SC. Thomas’ widow Cloe sold his estate. Benjamin Maddox “junior” purchased items. Other purchasers were Thomas Donaldson, Edmund Gaines, Chandler Maddox, Lanty Maddox, and Losson Maddox. 1808: On 9 April, Benjamin Maddox “junior” purchased 165 acres in Laurens District, next to Samuel Neighbors, John South, Thomas Williamson. The land was along Greenville Road. William Maddox witnessed the purchase. 1810: The federal census of Laurens County, SC, lists Benjamin Mattocks, 26-45 years old, with 3 males less than 10 years old, 1 female 26-45 years old, 1 female 26-45 years old, and 1 female less than 10 years old. He was living near Daniel Cook, Cornelius Cook, John Grey and John Calhoun. 1810: On 9 November, the estate of John Maddox was sold. John’s widow Elizabeth was a buyer, along with Benjamin Maddox “junior,” Lawson Maddox, Augustus Maddox and Chandler Maddox. 1811: Benjamin Maddox was a legatee of Thomas and Janet Donaldson. Other legatees were James Donaldson, William Donaldson, Thomas Donaldson, and Reuben Donaldson (Source: Joyce Smelley Odom, “Maddox Family,” The Heritage of Abbeville, South Carolina, Don Mill, Inc., 1995, p. 106). Are we certain that “dec’d” is verbatim on the original August 1811 record? Could it instead be a note describing Benjamin’s departure from the area? What happened to Elizabeth Maddox after 1811 if she was widowed? Is there really no estate administration for the Benjamin Maddox who died in 1811? Nothing? Who were the 45+ years old people listed with this Benjamin “junior” on the 1800 census? Could the older man in the house be another “senior” Benjamin who we haven’t previously considered? Benjamin Maddox #3 (1776-1855) is our 3rd-great grandfather. We have long maintained that he is the direct descendant of Benjamin Maddox #1. Benjamin Maddox #3 is proven to be the father of Joseph Maddox, our 2nd-great grandfather, in estate records. We have normally called him Benjamin Maddox (III). This Benjamin Maddox #3 could easily be the continuation of Benjamin #2 if Benjamin #2 weren’t reportedly “dec’d” after 1811. 1776: Benjamin Maddox was born in South Carolina, according to the 1850 censuses of Crawford County, Illinois. 1800: Joseph Maddox was born in South Carolina, according to the 1850 and 1860 federal censuses of Crawford County, Illinois. His parents were Benjamin and Charlotte Maddox (Source: All of Benjamin’s children are listed in a petition by Hannah Maddox et al, 27 February 1865, Crawford County Court Records, File Box 53, Case 34). 1810: The federal census of Laurens County, SC, lists Benjamin Mattocks, 26-45 years old, with 3 males less than 10 years old, 1 female 26-45 years old, 1 female 26-45 years old, and 1 female less than 10 years old. Joseph Maddox, the son of Benjamin Maddox, was 10 years old in 1810 and would fit into this census record; however, this Benjamin is identifiable with Benjamin #2, who reportedly died by 1811. The family was living near Daniel Cook, Cornelius Cook, John Grey and John Calhoun. 1823: Benjamin Maddox purchased 55 acres in Christian County, Kentucky, along the Stone River from Temple West (Source: August 1823, Christian Co, KY, Deed Book P, p. 147). Benjamin’s son Joseph owned land nearby (Source: March 1837, Christian Co., KY, Deed Book [letter? ], pp. 299-300). A preponderance of the same families that had neighbored Benjamin in South Carolina can be found alongside Benjamin’s name in early Christian County deed books (P&Q), including the Long, Ford, Knight/Night, McKee/Magee, Ware and Grey families. 1855: Benjamin Maddox died in Crawford County, Illinois, and was buried in the Maddox Cemetery near Heathville. 1895: Joseph Maddox’s son John Napoleon Maddox (1872 – 1945) married Frances Gaines (1878 – 1908) in Crawford County, IL. Frances Gaines was the 2nd-great grandchild of Stephen Gaines (1752-1837), who lived in Laurens County, SC. How was Benjamin #3 born in SC if we maintain that his father was in Charles County, MD, until 1790? Should we take his 1850 census record literally? This Benjamin Maddox #4 (1770-1864) could easily be the continuation of Benjamin #2 if Benjamin #2 weren’t reportedly “dec’d” after 1811. This Benjamin was born in Maryland, lived in South Carolina, and died in Georgia. Other researchers claim that Benjamin Maddox #4 is the same as Benjamin Maddox #2 and the son of Benjamin Maddox #1. 1770: Benjamin Maddox is born in South Carolina, according to the 1860 federal census of Atlanta, Georgia. 1840: On the federal census of Atlanta, Elbert County, Georgia, Benjamin Maddox was listed as 70-90 years old, living with a similarly aged woman and many children. He was living near William Calhoun, Eli Donaldson, and William Donaldson. 1860: On the federal census of Atlanta, Georgia, Benjamin Maddox was listed as 90 years old, born in Maryland. He was living with a dentist named Posey Maddox, 55 years old, born in SC. Researchers claim Posey was this Benjamin’s son. Can we find a record of Benjamin #4’s wife’s name in Georgia? If Benjamin #4 is not the same as Benjamin #2, then who are Benjamin #4’s parents in Abbeville? This Benjamin Maddox (1801-after 1880), the son of William Maddox (1776-1857), was born in Abbeville, SC, and ended up in Fayette County, Alabama, along with other members of the Maddox family from Abbeville. 1850: On the federal census of Fayette County, Alabama, Benjamin Mattax is listed as born in 1801, married to Nancy. Joyce Smelley Odom claims this is Nancy Williamson, daughter of Thomas Williamson. 1880: On the federal census of Fayette County, Alabama, Benjamin Madox is listed as born in 1801, married to Nancy. He was born in SC and his father was born in Maryland. Nancy was born in SC. Lawsin Matocks’ 1784 birth in SC seems to demonstrate that some Maddoxes arrived in Abbeville, SC, before 1790 – the year we’ve long assessed to be the SC arrival year of Benjamin Maddox (II). Could Benjamin Maddox #5 have been called “junior” in any of the 1801-1811 records in Laurens County and Abbeville County, SC? Until a chance encounter today with Charles County historian Anita Barbour Gordon, we did not understand the significance of the Moore’s Lodge location. From Anita’s description, Moore’s Lodge was the original seat of the Charles County government (1674-1727), and it was thoroughly excavated in 2008 after a century of searches for the exact location. The results of the archaeological excavation can be seen here. Important to us, James Maddox (first son of Cornelius Maddox) is featured in the archaeological team’s conclusions. He bought the original courthouse and jail in 1731. He salvaged the building materials and then flipped the property to Thomas Hussey’s grandson, John Hanson. Kayakers on Port Tobacco Creek, in Charles County, Maryland, recently found a pair of very old coffins floating downstream. It seems the coffins – which contained a mother and her child – surfaced after a major rainstorm further damaged the now-submerged Christ Church cemetery that used to lie on the bank of the creek. The Christ Church parish formed before 1692 and has met in at least three churches. The first of these was located just northwest of the once-thriving town of Port Tobacco, along the creek. 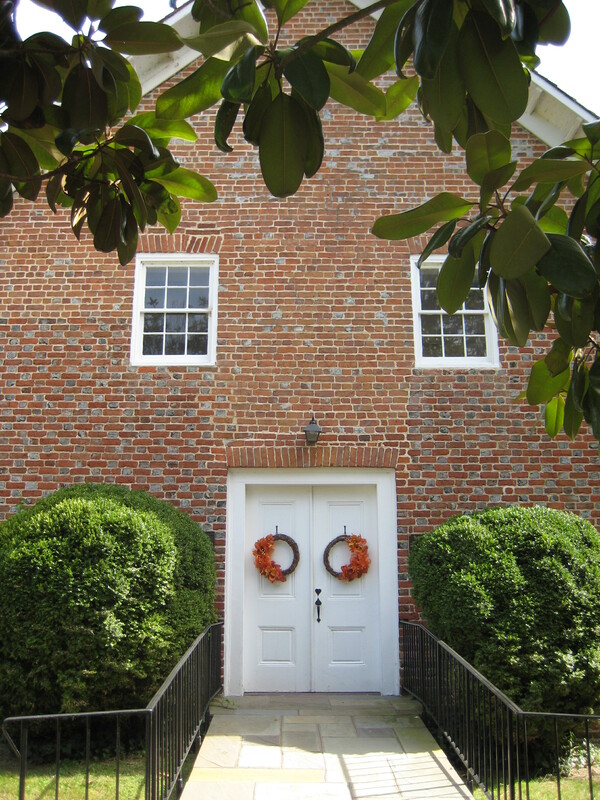 Following the destruction of the first, the congregation rebuilt its church on the Port Tobacco town square, and later moved to LaPlata as Port Tobacco withered economically. But the original Christ Church cemetery interments (now underwater) were never moved from the site northwest of Port Tobacco. One Maddox researcher believes that our Cornelius Maddox (1651-1705) and Benjamin Maddox (I) (1690-1773) were buried in the original Christ Church cemetery, but has provided no evidence. We tend to believe the assertion, since Christ Church would have been the closest Anglican church to Cornelius’ and Benjamin’s lands and would be the logical place for burial. But nobody has been able to produce a list of interments. During a visit to the Port Tobacco Courthouse today, local historian Anita Barbour Gordon relayed her father’s account of hunting ducks while perching atop semi-submerged gravestones in the Christ Church cemetery. Those stones are now fully submerged, and nothing remains of the place. A sign near the current Port Tobacco Courthouse points toward the location of the second Christ Church location. The original (Old Old Christ Church) location is in the opposite direction. An 1895 photo shows Christ Church as it stood in Port Tobacco in the 19th century. This stone church replaced the 17th-century original, which had stood to the northwest across Port Tobacco Creek. Three sons of our 8th great-grandfather Cornelius Maddox (1651-1705) – James, Edward and Walter – ran one of the inns in historic Port Tobacco, Maryland, before the Revolutionary War. Numerous court records describe them as innkeepers in the town – once a thriving port, but now mostly overlooked by historians. Port Tobacco had more than one inn, though, and we’ve never been able to pin the brothers to one specific inn. I had the good luck of bumping into local Port Tobacco historians Anita Gordon and Sheila Smith at the historic Port Tobacco Courthouse today. Sheila is a walking Charles County encyclopedia. Anita and her father are responsible for the only collection of sketches of Port Tobacco’s buildings and layout (called “Port Tobacco, Charles County, Maryland, Prior to 1895”), and she’s now in the process of collecting the history of Port Tobacco’s inns. Anita is trying to understand how many there were before the Revolution, and who ran them. I was glad to add the Maddox brothers’ names. We’re eager to know which of the inns that Jim, Edward and Walter might have run, and what dramas might have unfolded there (Port Tobacco attracted Declaration of Independence signers and other luminaries). We’ve always assumed they ran the St. Charles Inn (a.k.a. Brawner Inn, a.k.a. Chandler Inn), which was closely affiliated with the Brawner family, since the Maddoxes and the Brawners were intermarried at the time. But there were at least three inns in Port Tobacco at the time and none of the inns is specifically mentioned in the Maddox records. A map of Port Tobacco from the sketches in James Barbour and Anita Gordon’s book. The St. Charles Inn is at the upper left. Dr. Edward Maddox owned numerous tracts in the Maryland Colony in the mid-1600s, mostly along tributaries of the Potomac River in Charles County and modern Prince George County. A recent survey conducted by the Broad Creek Historic District provides estimates of the locations of Edward’s Stone Hill, Lyon’s Hole and possible Athey’s Hopewell tracts. See the map below. The Vainall tract, which is used as a reference in some of Edward’s deeds, was centered on 38.756851, -76.985385. Doges Neck: Charles County Circuit Court Liber H, Page 132: 5 Sep 1678; Indenture from Edward Maddock, apothecary, to John Reddick; for 30,000# tobacco; a parcel of land called Doges Neck; on the south side of the Piscataway River to the mouth of Chingamuxon Creek; laid out for 200 acres; /s/ Edward Maddock; wit. Rando. Brandt, Geo. Godfrey; acknowledged by Margery wife of Edward Maddock. Cheshire: Charles County Circuit Court Liber I, Page 125: 5 Jun 1681; Indenture from Edward Maddock, apothecary, and Margery his wife, relict of Matthew Stone, to William Chandler, Gent. ; a tract called Cheshires being part of Poynton Manor; inherited by Margery from the will of William Stone; containing 500 acres; for 40,000# of tobacco; /s/ Edward Maddock, Margery Maddock; wit. Tho. Hussy, John Richards. Nanjemoy: Charles Co., MD, Land Record L #1, folio 142: 17 February 1684, Edward Maddock and wife Margery of Stafford Co., VA, conveyed 500 acres called “Nanjemoy” in Charles co. to Gerard Fowke. Numerous Maddox and Maddox-associated tracts are described in the Charles County Circuit Court Land Survey, Subdivision, and Condominium Plats, including a few we haven’t seen before. The Maryland Society of Sons of the American Revolution have provided the Maryland General Assembly Assessment Record for Charles County, 1783 (and other years), providing insights into the conditions of the Maddoxes’ life at the time… http://www.mdssar.org/sites/default/files/archives/1783taxlists/Charles_Co_MD1783OPT.pdf. Importantly, all of these Maddox sites were listed in the Durham Parish section of the tax list, meaning that the Maddoxes on this list probaby would have attended the Durham Parish church called Christ Church or Ironsides). Leonard Maddox is listed on p. 144 as owner of Horn Fair, 150 acres valued at 75, with small dwelling house on site. Polly Maddox is listed on p. 144 as owner of Hornfair “pt” (probably the land called Hornfair Addition in other documents), 30 acres valued at 15, in “poor forrest” with a small house on site. John Maddox is listed on p. 147 as owner of Planters Delight and Renewment, with various houses, and on p. 148 as owner of Reserve. He seems to have been doing the best of the lot. Rhody Maddox is listed on p. 143 as owner of Fo-nd Hill, 33 acres, very poor quality, and on p. 140 as owner of Blue Plains “pt”, 88 acres, very poor quality with small dwelling house. Edward Maddox is listed on p. 140 as owner of Blue Plains “pt”, 179 acres with a “sorry” dwelling and kitchen, tobacco house and corn house. General Washington, General Smallwood, Daniel St Thomas Jennifer, and George Mason owned land in the same area.